A Pakistani radical Islamist political party, which was leading a nationwide protest against the acquittal of a Christian woman convicted for blasphemy, late Friday night called off its agitation following an agreement with the government that assured initiation of a legal process to place the woman on the exit control list that will prevent her from flying abroad, officials said. 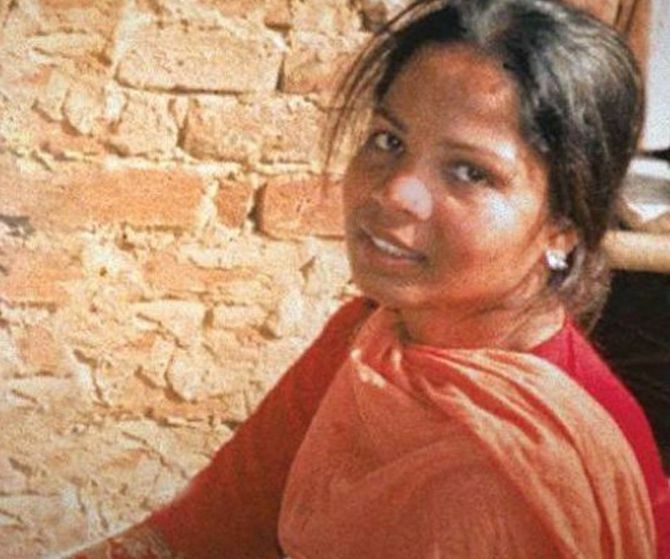 The government will also not oppose a review petition filed against the Supreme Court's judgement in the Asia Bibi blasphemy case, they said. The Tehreek-i-Labaik Pakistan has in turn apologised if it "hurt the sentiments or inconvenienced anyone without reason". Informing reporters that an agreement has been reached between the government and the TLP, Federal Religious Minister Noorul Haq Qadri said it was a good news for the people who have been suffering from the last three days due to the protests. The apex court's judgement, which was pronounced last Wednesday, triggered protests across Pakistan with agitators led by Islamic political party Tehreek-i-Labaik Pakistan (TLP) and other groups blocking major highways and roads in different parts of the country. "As per the agreement, the government will immediately initiate a process to place the name of Asia Bibi on the no-fly list (exit control list)," an official said. The agreement was signed in Lahore between Punjab Law Minister Basharat Raja and a three-member TLP group led by Pir Afzal. Soon after the signing of the agreement, TLP leader Allama Khadim Hussain Rizvi announced the ending of the protests. "Pakistan is saved from bloodshed. It is the government's success that a breakthrough was made. We are happy that this matter has been resolved amicably," Punjab Information Minister Fayyazul Hasan Chohan said. During the three-day nationwide protests, several major roads in Lahore, Islamabad, Karachi and other cities were blocked. The education institutions were also closed in Punjab, while private schools were closed in Khyber-Pakhtukhwa provinces as well as in cities like Karachi and Islamabad. Many universities across Pakistan also announced cancellation of papers due to the ongoing tense situation. Business and trade activities were also badly affected and mobile phone and internet services also remained suspended in major cities. Over 50 policemen were also injured in Punjab on Friday during clashes with the protestors. According to a source in the government, Pakistan's military establishment has played a vital role in persuading the TLP to end the protest. Earlier in the day, Pakistani Army spokesman Major General Asif Ghafoor told state-run channel PTV that a government team, including a representative of ISI was holding talks with the protestors. The Imran Khan-led Pakistan Tehreek-i-Insaf (PTI) said Thursday that the federal government does not plan to "put Asia Bibi's name on the exit control list (ECL) or [file an] appeal for a review against the apex court's verdict”. It also said that the review petition was "filed by the concerned party, which has nothing to do with the government”.